With three great recommendations for the Black Goose Cafe from my friends Gregg, Lindsey, and Liz, Mom and I were very excited to be heading there for lunch on this chilly afternoon. When we first pulled into the small parking lot, we didn't see any other cars. Thinking that the Black Goose might be closed, I gave them a call on my cell. After all, why get out of the car when you can just pick up a phone? Someone did answer the phone, so Mom and I quickly found ourselves headed up the stairs that lead to the patio area. After some mix up with the front door (perhaps they should put an arrow that points to the actual entrance), Mom and I stepped inside at 3:30 p.m.
After paying, I asked to take a menu back to the table so we could further examine it. The cashier informed me that they had takeout menus available. 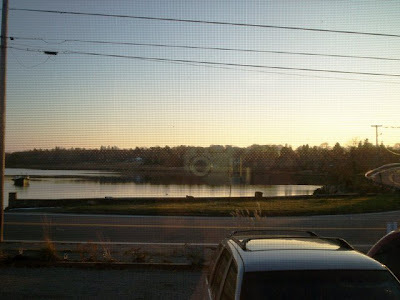 I grabbed one and took my seat by the window, which overlooks Tiverton's Nanaquaket Pond. After sitting down, I noticed that they did in fact have the pumpkin chai. Oh well - maybe next time! 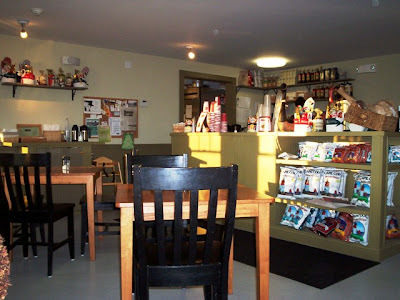 The Black Goose is very cute and trendy, yet welcoming and pleasant. The black chairs and wood tables really stand out against the beige and green walls. There are no booths here, and only about eight tables, so I'm assuming that they do a substantial takeout business. When walking in, customers are greeted with a large display case that features some of their baked goods, and two large drink cases that house various soft drinks and flavored waters. There is also a display area that features several varieties of New England's favorite potato chip - Cape Cod (I personally think they are way too greasy). Soft music and lighted lanterns bring a sense of tranquility to the dining area, and a station with extra napkins and straws is decorated with a large corkboard displaying local advertisements and activities. There is also one unisex restroom at the back of the restaurant, and several large windows that overlook the pond. Along with the large chalkboard that features daily specials and winter specialities like the apple pie and eggnog lattes, the Black Goose has both a breakfast and a lunch menu. Their breakfast panini list includes the egg, black forest ham, and provolone sandwich ($4.95), while their breakfast stratas are their house speciality. Stratas include the cinnamon raisin French toast souffle ($4.95), and the hash brown and applewood bacon souffle ($4.95). Quiche varieties include the three cheese ($4.95), and the spinach, tomato, and Swiss ($4.95). Baked goods are also available like the raisin scones ($1.95) and the bagels and cream cheese ($1.99), and the ginger scones ($1.95) are a customer favorite. You can also order a bowl of steel cut Irish oatmeal ($3.95), with toppings ($.25 each) including pecans, almonds, dried cranberries, raisins, and banana chips. For healthier diners, a cup of fresh fruit ($4.95) or fresh fruit, granola, and yogurt ($4.95) is available. The beverage brands include Seattle's Best Coffee and Tazo Teas, and other options include fruit juices, smoothies, frozen coffees, and an espresso bar. For lunch, the Black Goose features a list of Greek cuisine, and a note at the top of the menu reads that "Yia Yia's recipes are served with rice with red sauce and a side Greek salad." Specialities include the moussaka ($8.95), the pastitsio ($8.95), and the spanakopita ($7.95), which is spinach and feta cheese blended between layers of crispy phyllo dough. Lunch salads include the Greek ($5.99) and Caesar ($5.99), and you can add grilled chicken, tuna salad, or chicken salad to any of them for just $1.99. Available soups and quiches vary daily, while a list of deli sandwiches include the Black Goose chicken salad ($5.75), the roast beef ($5.95), and the grilled chicken breast ($5.75). 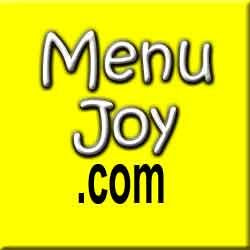 You have your choice of breads and assorted toppings. 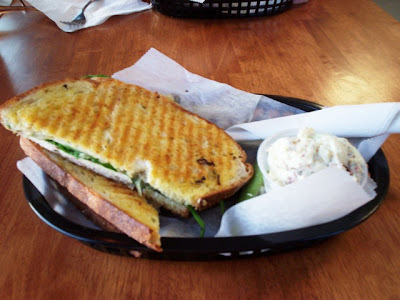 Paninis include The Godfather ($6.75), which is prosciutto, Genoa salami, pepperoni, provolone, roasted red peppers, basil, and baby spinach, while the signature sandwiches include The Bat Out of Hell ($6.95), which is grilled meatloaf, cheddar cheese, and spicy caramelized onion sauce on country white bread. All sandwiches and paninis are served with a side special and a deli pickle. Our chai had arrived first, and they were incredible. The gingerbread flavor was very potent and the drink itself was very creamy and delicious. The sandwiches arrived soon after in small baskets, accompanied by cups of potato salad, two pickles, and silverware. We both commented on how large the sandwiches were, and that we certainly got a lot for our money. Mom's sandwich was served on very large slices of country white bread, which was very soft with a crisp crust. The chicken was freshly grilled - not deli meat. It was nicely sliced into the sandwich. The bacon was perfectly done, and was thick and meaty. The romaine was nice and crisp, and the Caesar dressing was a cool touch. It was a great combination, and Mom loved it. 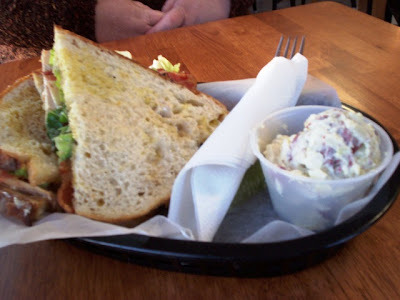 It was almost like having a chicken Caesar salad in the form of a sandwich. She would definitely get it again. The only downside was that it seems to have been buttered on the outside, and since her sandwich was not going to be grilled, she didn't know why it was buttered. It made the sandwich a little bit greasy and moist to hold. My sandwich was amazing as well. I fell in love with the lean, grilled chicken breast, and the cheese, spinach, and onions were all very fresh and tasty. Liz was right - this sandwich is fantastic! The only downside was the butter. Because my sandwich is a panini, it gets placed on the grill. This is fine, but I believe mine may have been a little over-buttered. It was difficult to hold, and was very greasy. It almost took away from the taste of the sandwich. Perhaps if they were to go a little lighter on the butter next time, I would have been able to enjoy it even more. Also, the potato salad they served with it was delicious. It was very fresh and creamy, and the red potatoes were served with the skin on. It was great! Both Mom and I were approached by one of the servers during the meal and were asked if we would like a box for the other half of our sandwich. Since we hadn't finished eating yet, Mom declined. Although neither of us were able to finish that second half, we definitely enjoyed ourselves and were very glad we had chosen both of the sandwiches. Now, here' s a question. Both Mom and I were confused as to whether or not we should leave a tip. We got some money out and placed it aside, but since we ordered at the counter, we weren't sure who would be getting the money. I wanted to wait and see if some of the other customers had left a tip. Mom decided to use this time to go to the restroom. She said the bathroom was average, but she was a bit horrified to see that the bathroom window did not have a curtain. Thankfully, the window is very high up on the wall so that no peeping Toms are able to take a look inside. Also, the bathroom seemed to be missing some supplies. When Mom came out, another table was getting ready to leave. I looked at what they'd left behind for the waitress, but did not see a tip. Confused, Mom and I left nothing (sorry!) and said goodnight to the staff. When we got to the car, we were still wondering if we should have left a tip. Does anyone know the answer to this? What is the proper etiquette? We were so impressed with the Black Goose, that we tried to stop by again - this time for breakfast. Unfortunately, there was a snowstorm and our plans had to change. Luckily, we don't think the Black Goose is going anywhere anytime soon, and a big thank you goes out to Gregg, Lindsey, and Liz for suggesting such a great place. 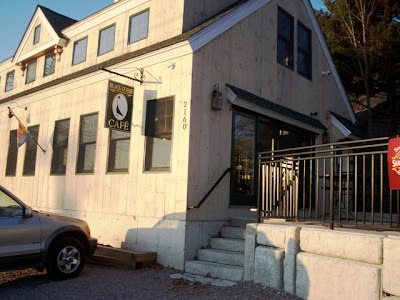 The Black Goose Cafe is open from 6 a.m. to 7 p.m. Monday through Friday, and from 7 a.m. to 7 p.m. on Saturday and Sunday.